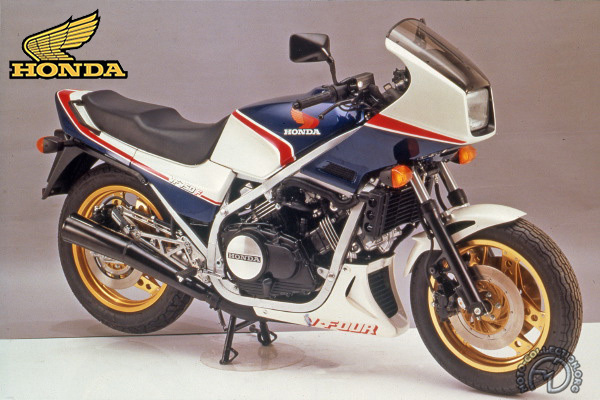 In 1983, Honda set about launching the V-four models on which the marque had pinned all its hopes. When the original VFS and C failed to catch on, the Japanese giant unveiled the VF750F, which proved a genuine success. Aggressive and original, it was in stark contrast with the conventional appearance of the S. This esthetic difference served to highlight the profound personality differences between the two models. The latest arrival was positioned as an up-to-the-minute sport machine. Honda did not hesitate to adopt the techniques that had recently been introduced on its racing bikes. The design of the chassis was based on that of the works 500cc racers, while the 16 inch front wheel was taken directly from racing practice. Inevitably, this sophistication was translated into a price around 20 percent higher than its rivals. However, thanks to its many improvements, the V-four engine was now developing over 90 hp and the VF/F was the most powerful bike in its class. It boasted a stack of dynamic qualities that were so outstanding that they made its rivals seem as though they came from an earlier generation. Besides the engine, powerful and with incomparable mid-range torque, the Honda had a cycle part that combined stability and agility, precision and lightness of steering that no other bike could match. It was an effective sports bike, while its comfortable suspension and excellent weather protection made it an equally successful roadster. The Honda VF750F drew heavily on competition experience for its technical features and gave the marque its first touch of V-four class. Inset is a preproduction "clay" design study.